Mention TikTok to anyone over the age of 18 and they’ll probably think it’s a Kesha song. A decade since that catchy release (yes, really) and we’ve realised it’s actually a multi-billion dollar social media channel, piquing the interest of marketers worldwide. It’s collaborative, it’s addictive and it was the fourth most-downloaded app last year - beating Instagram, YouTube and Snapchat. Time to swot up, then. 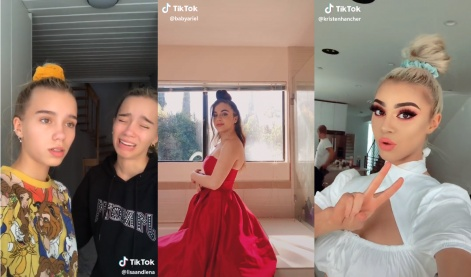 Developed in China, TikTok is a fast-growing social media platform that allows users to share short, snackable videos of themselves. The app is a cocktail of trends, blending Snapchat’s easy video-recording features with the accessible community of Instagram. And the cherry on top? A music library to rival Spotify. TikTok is a Gen-Z and millennial meme machine, filled with lip-syncing, dancing, challenges... and putting makeup on potatoes. If it looks familiar, that’s because it was Music.ly in a former life. Famous for popularising the lip-sync frenzy, Music.ly built up a user base of over 200 million before merging with app developer ByteDance in a $1 billion deal to form TikTok in 2017. From 15-second videos to music, filters and funky effects, the features on both apps are pretty much identical. The new ‘It’ app is an influencer goldmine, reaching over a billion downloads to date. That’s a 275 per cent increase from 2017. Last summer, ByteDance claimed TikTok had 500 million active monthly users worldwide. I’ve just taken one glance at TikTok’s 2019 top-hit playlist and booked myself into a retirement home. But if I was a tween girl right now, I’d be sharing lip-syncing videos as fervently as I collected Smash Hits lyrics in 1999. The app’s wildly extensive, officially licensed song library allows young users to project themselves onto their favourite pop stars. The teenage dream. On top of a library of catchy tunes, TikTok ticks all the social media boxes, with everything from ‘beautifying’ filters to pitch-shifting. It’s jumped on Snapchat’s simple video recording and sharing functions: shooting, editing and publishing are easy to use, resulting in professional-looking music clips with viral potential. App Ape Lab studied the app’s demographics and found that teenage users used TikTok the most, followed by 20-somethings. Unsurprising, but important - these are the generations brands need to harness trust with for decades to come. The most desirable consumers for now and the future. What’s also interesting is that user figures don’t go down as age increases: the app is more popular with those in their 40s than those in their 30s. How should brands use TikTok? German identical twins Lisa and Lena are nearing 33m fans on the app - they’re 16 years old and a fashion brand’s dream. Baby Ariel is one of the most raved-about creators on TikTok. At 18-years-old, she’s close to the 30-million-fans mark and has just released her own song ‘i heart you’. Cosmetic companies crave TikTok partnerships with Kristen Hancher. With 21.6m fans, her makeup tutorials and lip-sync clips have made her one of the most popular influencers on the channel. Of course, we’d all love the budget to work with the creme-de-la-creme of creators. But if you’re not a multi-billion-dollar company, you can still market yourself on the app. The beauty of TikTok is that most users are just at the beginning of their influencer career. They’re ripe for picking when it comes to affordable, mutually beneficial brand partnerships. And if you need one golden marketing strategy to make it easy for them to say yes - kick off a ‘challenge’. What is a TikTok challenge and why are they marketing gold? ‘Challenges’ are massively popular on the app and a smart way to attract attention to a marketing campaign. More than five million videos went up in response to the #InMyFeelings challenge - basically a viral dance craze where users shared videos replicating the exact moves to hit Drake song ‘In My Feelings’. #InMyFeelings was followed by #InMyDenim, a challenge set by fashion brand GUESS, which partnered with TikTok for the campaign. Riding the Drake wave, GUESS encouraged users take part in a denim transformation challenge, kicking it off with influencers such as @ourfire (and her two-million-plus fans). Very clever stuff.